We were asked to create a solid network that included a number of wireless access points. The job grew as we worked our way through it as we found some equipment we felt would be best wired to the network in order to ensure they have a constant connection. This also left some space for the wireless devices. All cables would be sent from a small rack situated with the incoming broadband connection. We could then easily send data from that point down a patch panel. On top of that we had two rooms of audio that needed a strong wireless connection. Our plan was to cable from the rack and down into the large basement under the lodge. Most of the routes were easily accessible from beneath and there was an existing cable route to the second floor which we followed. 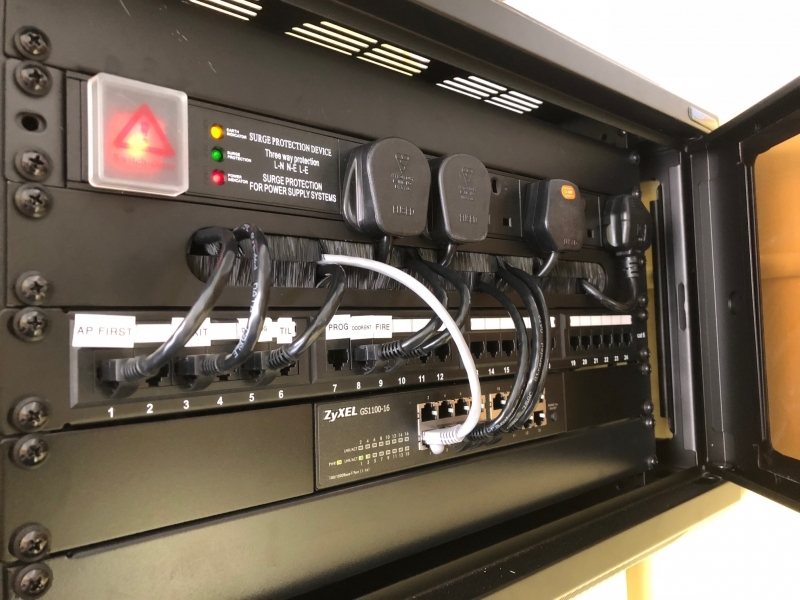 The data cables would supply the till in the bar, fire alarm, door entry system, gas and electricity data logger, 2x wireless access points and a connection to the SONOS amp on the second floor. The AV rack was 12U and wall mounted. It simply housed the draytek router, Zyxel 16 port POE switch, 24 port patch panel and surge protection power supply.